Motion to accept January 27, 2005 General meeting minutes as circulated. A deposit of $8500.00 was apparently made to the gaming fund on February 12, 2005 but is not included in the financial report. Various RASC Centres newsletters, Gaming Grant letter, Space Technology flyer, Curtis Elite bill, BCHydro bill, Terasen statement, GST confirmation statement, RASC General Assembly application form, Bell Canada questionnaire. A letter from JPL regarding ‘NASA Space Place’ has been answered with the hope that we will soon see their articles back on our website. The scope drive power supply and 3″ finder scope mounting brackets have been repaired. Motion: To appoint Al Whitman as this Centre’s Alternative National Representative and liaison with this Centre’s National Council Representative John Ascah for the remainder of the 2004/2005 fiscal year. We are FOR National Council being the ones to initiate membership fee changes. PROPOSAL #2. Change the fixed 60/40 Society/ Centre Fee Distributions to a flexible distribution. We are FOR this proposal. The NOVA program has been submitted to National. Plans are in the works to polish it up and make it available to all Centres. The following Astronomy Day activities were discussed. Education/Public outreach – Robin and Brian will be meeting with Bonnie Chappel from PG School Services in early March to discuss Astronomy and the Space Science curriculum to discuss how School District 57 could publicize the services of the observatory to their schools. Due to the restrictions stipulated in the Gaming document, Gil will submit additional information in an attempt to broaden the areas in which we can spend the money. At present, all $8500 must be spent on Education and Public Outreach. The original application also asked for funds for operating expenses, utilities, building repairs and maintenance, continuing technical and audio-visual improvements, and continuing property improvements to ensure public safety. In order for a project to be considered for implementation, a project description, expected benefit, detailed materials and associated cost proposal must be submitted to the executive. In future, these details must be presented prior to applying for a grant. This entry was posted in 2004 / 2005, Meeting Minutes on February 23, 2005 by glen_h. 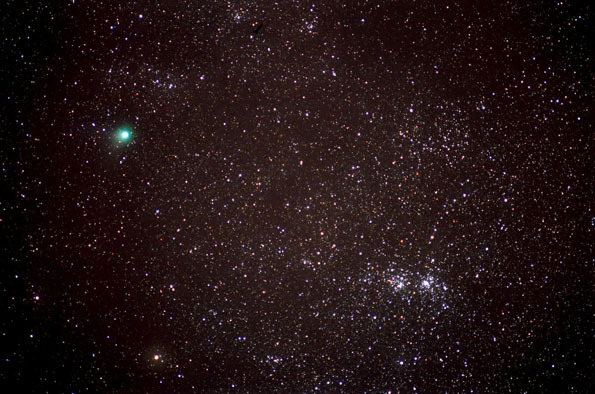 Shot of the comet in the same field as the double cluster. Taken the evening of Jan 28, 2005. Details: Canon FTbN, 35mm camera. 200mm lens at f4 piggy backed on my LX 10 scope. Fuji 400 print film. Single shot, hand guided for 30 minutes. I did improve the contrast a bit using Photo Shop Elements. This entry was posted in Astro Photos of the Month on February 13, 2005 by glen_h. Meeting Called to Order at 7:35 p.m.
Maurice distributed several wall panel information sheets. A consensus was reached to glue felt material to the bottom of the chair legs. The ultimate goal is to replace the plastic chairs. Donna Ascah’s sketched suggestions to redecorate the classroom were circulated and discussed. Placing a dark fabric on the ceiling will be the first of several steps to reduce the sound level in the classroom. Two sessions of Youth Day activities will be held on Friday, March 25th during Spring Break. The 10” Dobsonian telescope can be signed out for member’s use. An Observatory Key workshop (familiarization with all the observatory equipment and operating procedures) will be incorporated into the NOVA workshop curriculum. Gate keys for new members will be available on request. Bob will hunt through his archives for more newspaper articles. Volunteers for March events will be handled through email and the next general meeting. This entry was posted in 2004 / 2005, Meeting Minutes on February 9, 2005 by glen_h.